Every year after the marching season ends (after Grand Nationals), we conduct voting to decide which bands to name “Bands of the Year.” This year’s voting consisted of 11 voters, both Illinois Marching Online staff members as well as State of Illinois band directors – the largest turnout to vote we’ve had to date. All of the bands listed below have achieved high quality compared to their peers, and are worth of special honor. This year marks the debut of our caption awards. Caption awards were discussed between the members of the Illinois Marching Online staff (band directors had no input). We hope these caption awards recognize special parts of some particular bands that really made this season outstanding. 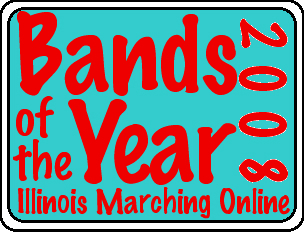 Without further ado, the 2008 Illinois Marching Online Bands of the Year!